Stay connected with an OCENS Land Mobile communications solution. 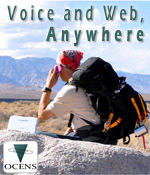 Connect to the Internet anywhere with a BGAN terminal, a mobile satellite hotspot that provides a broadband internet connection and simultaneous voice channel. 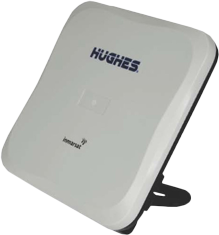 The new Hughes 9202 terminal is battery powered, compact, and lightweight (only 3lbs.) and has built in WiFi so you can use it with your tablet or smartphone. Stay in touch with your business and family no matter how long your adventure. If you think twice about venturing into areas that are outside of cellular reception, an Iridium satellite phone frees you from that concern. The Iridium network provides coverage for 100% of the earth's surface so you'll never be too remote to be able to call for help. The new 9575 model also features built in GPS tracking and an SOS button. It is compact, portable, rugged, and weatherproof, and truly a must-have for any trip that is "off the beaten path." Or, for more information, Call toll-free: 1-800-746-1462.